The Native American story of the War with the Creek Nation. Learn about the culture, stories, and legends of American Indians and their famous chiefs, tribes and wars. A Native American story of the War with the Creek Nation to teach kids about Native Indians in a short, enjoyable, easy to read format. The Creek nation, which was originally settled on the Ohio River, derives its name from the many beautiful streams which flowed through their extensive domain in Georgia. The Muskoki was their mother-tongue, though in some of their towns the Uchee, Alabama, Natchez, and Shawnee tongues prevailed. The general council of the nation was always held in the great public square of the principal town. In each angle of this square were three cabins of different sizes, twelve in all. Four avenues led into the square. One of the cabins—that of the Grand Chief—fronted the rising sun, to remind him that he should guard the interests of his people. Near it was the Grand Cabin where the councils were held. All the cabins were painted red, except those of the old men, facing to the west, which were white, symbolizing virtue and old age. Annually, in the month of May, the chiefs and principal men assembled here to deliberate upon all subjects of general interest. During the session none but the principal chiefs could approach nearer to the Grand Cabin than within twenty feet. In the centre of the square a fire was kept constantly burning. At sunset the council adjourned for the day, and then the young people of both sexes danced awhile round the fire. At sunrise the chiefs were called by beat of drum to the duties of the day. The presiding chief of each town was called the "Micco," and bore the name of his town, as Cassetta Micco, Tookabatcha Micco, etc. He was always of the best family, held his station for life, and at death was succeeded by a nephew. The Micco had the appointment of the Great Warrior, as the leading military chieftain was called. One of their most interesting ceremonies is the Boos-ke-tan, or Green Corn Dance. It is celebrated in the months of July and August, and lasts from four to eight days. The ceremonies consist principally of dancing, ablutions, and medicinal applications, and is their manner of celebrating the harvest-time. It is also the occasion of a general pardon for all crimes except murder. The policy of the Creeks, like that of the Iroquois, was to encourage the smaller tribes to join them. In this way they greatly increased their strength and importance. At the time of their greatest prosperity they prohibited the importation of all kinds of ardent spirits into their country. Another peculiarity of this Indian nation was, that before setting out on warlike or other expeditions, the men assisted the women in their planting. While the American Revolution was in progress, the Creek Indians were employed by the British authorities to harass the Whig inhabitants of Georgia and the Carolinas. Their leader, Alexander McGillivray, was a remarkable man. He was the son of a Scotch Indian trader by the half-breed daughter of a French officer. Receiving a good education, he was placed in a counting-house in Savannah, but preferred to live with his mother's tribe, in which he soon took a high position, and with his father warmly espoused the royal cause. He led several expeditions against the Whigs, but his genius was for diplomacy rather than war. Leclerc Milfort, an able French officer, his brother-in-law, and an English adventurer, named William Augustus Bowles, were the principal military leaders of the Creeks during this period. After the war had ended, McGillivray, in behalf of the Creek confederacy, became the ally of Spain, and had the rank and pay of a colonel. In 1790 he transferred his influence to the United States Government, ceded territory to it by treaty, and promised to divert to it from the Spanish at Pensacola the trade of his nation. He was, at the same time, appointed agent of the United States and a brigadier-general in its army. This transaction affected his popularity with the Creeks, but it did not prevent his obtaining an increase of salary and authority from the Spanish Government. McGillivray died in 1793, greatly mourned by the Creeks. His ability and sagacity had given them a degree of importance to which they had never before attained. For many years these Indians had been managed by their agent, Colonel Hawkins, with prudence and sagacity. The location of a public road through the heart of their country, in 1811, created much dissatisfaction. Through this "Federal Road," as it was called, a continuous stream of emigration flowed in, and the Indians foresaw that they should soon be hemmed in on all sides. To increase their dissatisfaction, British emissaries were busy among them, endeavoring to stir them up to war with the Americans, who were at this time engaged in the invasion of Canada. But the most formidable enemy of the Americans was Tecumseh, who, during the latter part of the year 1811, labored among the Southern Indians—as he had for years been laboring among the tribes of the west and north-west—upon his great and patriotic plan of confederating all the tribes against the United States. On his return north he found that his brother, the Prophet, had rashly brought on the battle of Tippecanoe, and that his grand enterprise was totally ruined. Thirty mounted warriors accompanied him to the Gulf regions. Passing through the Chickasaw and Choctaw country, he was unsuccessful in his efforts to array these tribes against the Americans. With the Seminoles he was completely successful. At Tookabatcha, Colonel Hawkins, the agent, had assembled five thousand Creeks at a great council. This ancient capital never before looked so gay and populous. Tecumseh, with his followers, was present. All flocked to see the famous orator and warrior of whom they had so often heard. After the agent had concluded his first day's address, Tecumseh and his followers marched into the square, all of them naked except their flaps and ornaments. Their faces were painted black, and their heads were adorned with eagles' plumes, while buffalo-tails dragged behind, suspended by bands around their waists. Like appendages were also attached to their arms, and their whole appearance was as hideous as possible. Their bearing was exceedingly pompous and ceremonious. They marched round and round in the square, and then approaching the Creek chiefs, they cordially gave them the Indian salutation of a handshake at arm's-length, and exchanged tobacco in token of friendship. One chief, Captain Isaac, refused to greet Tecumseh. He wore on his head a pair of buffalo horns, and these he shook at the Shawnee visitor with contempt. "Tecumseh," said he, "is a bad man, and no greater than I am." After Hawkins had finished his business and departed, Tecumseh, who had hitherto kept silent, made a speech in the grand council-house, full of fire and eloquence. He exhorted his hearers to abandon the customs of the pale-faces and return to those of their fathers. He warned them that servitude or extinction awaited them at the hands of the white race, and desired them to dress only in the skins of beasts, which the Great Spirit had given to his red children for food and raiment, and to resume the use of their old weapons. He concluded by telling them that the powerful King of England was ready to reward them handsomely if they would fight under his banner against the Americans. The next speaker, who, though not the brother of Tecumseh, seems, like Elkswatawa, to have assumed the role of prophet, had learned in Canada that a comet would soon appear, and told the excited warriors that they should see the arm of Tecumseh, like pale fire, stretched out on the vault of heaven at a certain time, and that by this sign they would know when to strike. He declared that those who joined the war party should be shielded from all harm, none of their would be killed in battle, and that they would finally expel the Georgians from the soil as far as the Savannah. It was almost morning when the council adjourned, and more than half the braves present had resolved on war against the Americans. "Tustenuggee-Thlucco, your blood is white. You have taken my red sticks and my talk, but you do not mean to fight. I know the reason You do not believe the Great Spirit has sent me. You shall believe it. I will leave directly, and go straight to Detroit. When I get there I will stamp my foot upon the ground and shake down every house in Tookabatcha." The event gave tremendous effect to Tecumseh's words. The comet—the blazing "arm of Tecumseh"—appeared, and at about the time when Tecumseh was supposed to have arrived at Detroit there was heard a deep rumbling in the ground, and there was a heaving of the earth that made the houses of Tookabatcha reel and totter as if about to fall. The startled savages ran out of their hats, exclaiming, "Tecumseh is at Detroit! Tecumseh is at Detroit! We feel the stamp of his foot!" It was the shock of the earthquake that destroyed New Madrid, and that was felt over the Gulf region in December, 1811. The effect was electrical. The message Tecumseh had delivered to the Big Warrior was believed, and many of the Indians took their rifles and prepared for war. The Creek nation at this time numbered about thirty thousand souls, seven thousand of whom were warriors. They were divided in opinion on the question of war with the Americans, but the war party, consisting mainly of the young warriors, prevailed, and early in the year 1813 acts of hostility began. The Young Creek party, of which Weatherford was the soul, both feared and resented the rapid encroachments of the settlers upon the tribe's ancient seat. As Tecumseh said, "'The white men are turning our beautiful forests into large fields, and staining our clear rivers with the washings of the soil." When they heard of the disasters to the American arms in the campaign of 1812, and saw British cruisers in the Gulf of Mexico, then Weatherford became chief of the war party in southern Alabama. Soon the whole nation was in agitation, and civil war was upon them. Those who were friendly to the United States were murdered or driven off, their houses and towns were burned, and their stock destroyed. In July, a body of militia, while endeavoring to intercept a war party of Creeks, who were returning from Pensacola with British arms and supplies, were defeated and dispersed at a place called Burnt Corn. Thoroughly alarmed at last, the white population of southern Alabama took refuge in stockade forts hastily erected. These were commonly spacious wooden buildings, one story in height, around which strong pickets were driven into the ground; port-holes were made in the pickets for musketry. Such was Fort Mims, on the shore of Lake Tensaw, in southern Alabama, whose stockades enclosed an acre of ground, entered by two ponderous gates, one on the east, the other on the west. Within the enclosure there were a number of cabins and small buildings, also an unfinished block-house. Into this work—a sufficient defence if properly guarded, but only a slaughter-pen if not—five hundred men, women, and children had collected for safety, when Weatherford, with one thousand warriors, who had lain in ambush in a ravine within four hundred yards of the stockade, surprised and captured it at noonday. So many rumors of approaching savages had been heard from day to day that the inmates had become indifferent, believing all were false. Two slaves, who, on the preceding day, had reported having seen twenty-four painted savages lurking near, were disbelieved and severely flogged. Precisely as the clock struck twelve, the drum in the fort beat to dinner. Officers and men laid aside their arms, and gathered to the meal in various parts of the stockade. This was the moment Weatherford had chosen for the attack. At the first tap his naked, painted warriors, thirsting for blood, sprang from the ravine and rushed in a tumultuous mass for the gate of the fort. The foremost of them had reached a field only one hundred and fifty yards distant, and were streaming across it with hideous whoops, before a sentinel saw or heard them. The terrible cry, "Indians! Indians!" arose; the women and children fled to the houses, and the men rushed to the port-holes. Sword in hand, Major Beasley, the commander, rushed to the gate and endeavored to shut it, but was prevented by the drifted sand, and was struck down before he could accomplish it. The savage horde, resembling demons rather than men, poured in. Five of their prophets, who were in the advance, were immediately shot down. They had boasted that the bullets of the Americans would not harm them. Their fall dispelled this illusion, and many of the Indians for a time retreated. The eastern part of the picketing was, however, soon filled by them, and they began a general and effective fire on the garrison. Captain Middleton, who was in charge of the eastern section, was soon slain, with all his command. Captain Jack, in the south wing, with a rifle company, long maintained the desperate conflict. Lieutenant Randon held the guard-house on the west, and Captain Dixon Bailey, a gallant half-blood, on whom, after the fall of Beasley, the command devolved, was seen in every part of the fort, directing and encouraging its defenders. For three long hours the battle raged. It was finally terminated by the setting on fire of the wooden buildings in the enclosure by means of burning arrows shot into their roofs. They were soon consumed. For the helpless women and children the terrible moment had arrived. The hatchet, the scalping-knife, and the bullet did their bloody work. None were spared save a few half-bloods and the negroes, who were made their slaves, The garrison had sold their lives dearly, not less than four hundred Creek warriors having been slain or wounded. Of the garrison, twelve only escaped. A little before noon on this fatal day, Zachariah McGirth left the fort to go to his plantation. Soon he heard the firing, and believing it to be an attack on the fort, hastened to the spot as soon as the Indians had left, to ascertain the fate of his wife and children who had remained. What a horrible spectacle met his eye! In vain he sought among the charred and mutilated remains for any trace of his loved ones, and he quitted the appalling scene, believing himself alone in the world. Rendered desperate by this misfortune, his only thought was vengeance, and no enterprise in the enemy's country was too daring for him to undertake. After a long service amid such dangers, a friend accosted him one day in Mobile, and told him that some people desired to see him at the wharf. There he saw—a common sight in those days—some wretched Indians who had been captured. He was asked if he knew them. While he hesitated, his wife and seven children advanced and embraced him. Overwhelmed with joy and astonishment he trembled like a leaf, and remained some moments speechless. Their escape from the massacre was owing to an act of kindness, many years before, to a little hungry Indian boy whom they fed and clothed and brought up. Grown to manhood, Sanota, as the was named, joined the expedition against Fort Mims, and accidentally coming upon Mrs. McGirth and his foster-sisters, he protected them from the ferocious savages around them, and, under the pretence of making them his slaves, took care of them. Sanota was afterwards killed at the battle of the Horseshoe, and Mrs. McGirth and her children made their way on foot to Mobile, where, as we have seen, they were restored to the husband and father. William Weatherford, the Creek leader, was the son of a white trader by the beautiful Sehoya, a half-sister of General McGillivray. He was one of nature's noblemen—honorable and humane. He vehemently reproved his followers for their cruelty at Fort Mims, and begged them to spare the women and children at least. His interference nearly cost him his life. Clubs were lifted against him, and he was compelled to retire. "My warriors," he afterwards said, "were like famished wolves, and the first taste of blood made their appetites insatiable." At about the time of the massacre at Fort Mims, a burial party just outside of Fort Sinquefield was suddenly set upon by one hundred Creek warriors, who rushed down a hill towards them. All reached the fort in safety. Failing to cut off the burial party, the Indians next endeavored to capture some women who were engaged in washing at a spring not far from the fort, thinking to make them an easy prey. Just at that moment Isaac Heaton, who had been cow-hunting, rode up with a large pack of dogs. Giving a tremendous crack with his long whip, and encouraging his canine army, Heaton charged upon the Indians. Such was the fury of the dogs that the Creeks were forced to halt and fight then. This flank movement covered the retreat of the women, who arrived in safety at the fort. Heaton's horse fell wounded under him, but rose again, and followed his heroic master, whose clothing was riddled with rifle-balls, into the fort. One poor woman, too feeble to move rapidly, was overtaken and scalped. Heaton received just praise for his bravery and presence of mind. Intense excitement and alarm throughout the south-west followed upon the news of the massacre. General Andrew Jackson, with a large force of Tennesseeans, proceeded to the scene of action, and at Tallasahatchee, Talladega, Hillabee, Autosse, Econachaca, and the Horseshoe, such severe chastisement was inflicted upon the Creeks as to completely humble them, after a campaign of five months, and compel them to sue for peace and pardon. The Indian's side of the story is rarely told. Several chiefs and leading warriors, who were in the battles of Emuckfau and Enotochopco, afterwards asserted that they "whipped Captain Jackson, and ran him to the Coosa Diver." Certain it is that, though he outnumbered them in these well-contested actions, Jackson had to retreat. At the battle of Calabee, fought by Georgia troops, under General Floyd, though the latter gallantly maintained their ground during the action, the Indians impeded their further progress into their country, and in a few days caused then to withdraw. Some of the incidents of the Creek War are too remarkable to be passed over in silence. 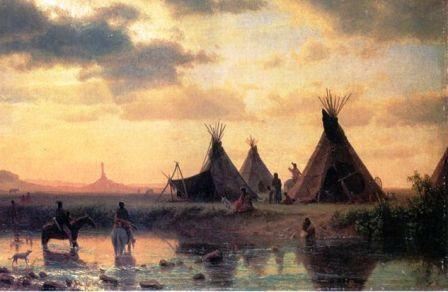 Just at sunset, one November day, a swift-footed Indian chief, who by stratagem had made his way from the beleaguered fort, informed Jackson that one hundred and sixty friendly Creek warriors, with their families, were hemmed in at Lashley's Fort in Talladega, thirty miles distant, with a scanty supply of food and no hope of escape. The besiegers were one thousand strong, and they so completely surrounded the little stockade that no one could leave it unobserved. The foe, feeling sure of their prey by famine, if in no other way, were dancing around the doomed people with demoniac joy, and conducting themselves as would a cat sure of a mouse. The messenger had made his escape by enveloping himself in the skin of a hog, with the head and legs attached, and in the darkness of night, while imitating its gait and grunt, and apparently rooting, was allowed to make his way unmolested through the hostile camp. When out of their reach he cast off his disguise, and with desperate speed made for Jackson's camp on the Coosa, which he reached on the following morning. By a rapid march Jackson succeeded in enveloping the besieging force, and at the battle of Talladega inflicted upon them a severe defeat, and rescued the friendly Indians, who were in a famished condition. Humbled by defeat, the Creeks at the Hillabee Towns sent a message to Jackson asking for peace. While awaiting the return of their messenger, they were attacked by a detachment under General White, who was acting independently of Jackson, and who was unacquainted with this overture, and a large number of unresisting Indians were massacred in cold blood. Naturally supposing this to be Jackson's answer to their prayer for peace, they thenceforth fought with desperation, neither asking nor accepting quarter. The true story of Captain Sam Dale's canoe fight with the Indians is as thrilling as any incident of fiction. It would be thought fabulous had it not been witnessed by his men on the shore, who, having no canoe, could render him no assistance. In the fall of 1813, Dale was engaged with a few followers in driving the small bands of marauding savages from the frontiers. At Randon's Landing they espied a large canoe, made from the trunk of an immense cypress-tree, bearing eleven naked and hideously painted savages, about to land at an adjacent canebrake. Dale, telling his men to follow, dashed forward to contest their landing. Seeing this, the Indians backed their canoe into deep water, three of them swimming and pushing it on the side not exposed to the bullets, and the others lying flat in its bottom. "Now for it, Big Sam!" At the same instant he presented his gun at Anstill's breast. The brave youth struck at him with an oar, which he dodged, and in return brought down his rifle upon Anstill's head just as the canoes came together. At that moment the long rifles of Smith and Dale came down with deadly force, and felled the chief to the bottom of the canoe. Such was the force of the blow inflicted by Dale, that his gun was broken near the lock. Seizing the heavy barrel still left, he did execution with it to the end of the combat. Anstill in a moment became engaged with the second warrior, and then with the third, both of whom he despatched with his clubbed rifle. Smith, too, was equally active, having also knocked down two of the Indians. Cæsar had by this time got the canoes together, and held them firmly, thus enabling Dale, who was in the advance, and the others to maintain a firm footing by keeping one foot in each canoe. In the midst of this unparalleled strife a lusty Indian struck Anstill with his war-club, felling him across the sides of the two boats, and, while prostrate, another had raised his club to dash out his brains, when Dale, by a timely blow, buried his rifle-barrel deep in the warrior's skull. In the mean time Anstill had recovered his feet, and, in a desperate struggle with another savage, knocked him into the river with the Indian's club which he had wrested from him. "Big Sam, I am a man—I am coming!" "Tar-cha-thee is a man! he is not afraid to die!" Dale then turned to a wounded warrior, who had been snapping his piece at him during the whole conflict, and who was now defiantly exclaiming, "I am a warrior! I am not afraid to die!" and pinned him to the canoe with his bayonet. "He followed his ten comrades to the land of spirits," said the redoubtable Indian fighter. Dale at this time was in the prime of life. He weighed over one hundred and ninety pounds and was six feet in height, with a large, muscular frame. He had a high reputation as a borderer and scout, and had passed much of his life as a trader among the Creeks and Cherokees. He was in after-life a brigadier-general by brevet, and served several terms in the Alabama legislature. His life was full of stirring incidents and "hair-breadth 'scapes." On one occasion, as he was kneeling down to drink at a spring, two Indians rushed upon him with their tomahawks, uttering the savage yell of assured victory. He knifed them both, and, though bleeding from five wounds, retraced their track nine miles, crept stealthily to their camps brained three sleeping warriors, and cut the thongs of a female prisoner who lay by their side. While in this act, however, a fourth sprang upon him from behind. Taken at a disadvantage, and exhausted with loss of blood, he was soon overpowered, and the knife of the savage was at his breast, when the blow of a tomahawk in the hands of the woman he had saved preserved the life of her deliverer. Like Boone, Kenton, Carson, and many other bordermen of high attributes, Dale entertained a strong attachment for the Indians, extolled their courage, their love of country, and many of their domestic qualities. In peace he treated them with great kindness, relieved their wants, and was held by them in high regard. In war, "Big Sam," as they called him, was an object of their dread and terror. The final and decisive conflict which ended the Creek War was fought by Jackson. The Indians concentrated all their warriors from the different towns at the bend of the Tallapoosa—called Tohopeka, or the Horseshoe, from its shape—and had strongly fortified it with logs and brush, and by erecting breastworks. They numbered one thousand two hundred, one-fourth of them being women and children. Jackson's army numbered two thousand effective men. The fire from his small cannon proved harmless, and the Indians whooped in derision as the balls buried themselves in the logs. He then stormed the breastwork under a deadly fire from the Indians, and with the bayonet soon put them to flight. General Coffee held the opposite bank of the river and prevented all escape on that side, so that the Indians were penned up in the peninsula, Jackson being in their front and Coffee in their rear. Not an Indian would suffer himself to be taken, or asked for quarter. That evening, when the contest ended, five hundred and fifty-seven Creek warriors lay dead on the field; many more had been shot attempting to escape by swimming the river. One noted chief escaped by taking to the water in the evening, lying beneath the surface, and drawing his breath through a hollow cane, until it was dark enough for him to swim across. General Sam Houston, then an ensign, displayed great bravery and was severely wounded in this battle. Afterwards, when a senator of the united States, he was the champion and defender of the Indians, boldly and repeatedly asserting that in our Indian difficulties, from the beginning, the Indian had never been the aggressor, but always the party injured. This blow was fatal to the power and dignity of the Creek nation. They had contended like heroes, but against the superior numbers and weapons of the white men they fought in vain. When the chiefs appeared before Jackson to sue for pardon, he sternly told them that one condition of their pardon was, that they must first bring in Weatherford, the cruel leader of the attack on Fort Mims, who could on no account be forgiven. To hold them harmless, and seeing clearly the hopelessness of prolonging the contest, Weatherford resolved voluntarily to surrender himself to the conqueror. This was, perhaps, the most striking incident of the war. "I am Weatherford, the chief who commanded at Fort Mims. I desire peace for my people, and have come to ask it." Jackson, greatly surprised at his boldness, said to him, "How dare you ride up to my tent after having murdered the women and children at Fort Mims?" "General Jackson, I am not afraid of you. I fear no man, for I am a Creek warrior. I have nothing to ask in behalf of myself. You can kill me if you desire. But I come to beg you to send for the women and children of the war party, who are now starving in the woods. Their fields and cribs have been destroyed by your people, who have driven them to the woods without an ear of corn. I hope that you will send out parties who will conduct them safely here, in order that they may be fed. I exerted myself in vain to prevent the massacre of the women and children at Fort Mims. I am now done fighting. The Red Sticks are nearly all killed. If I could fight you any longer I would most heartily do so. Send for the women and children. They never did you any harm; but kill me if the white people want it done." "Silence!" exclaimed Jackson, adding, with great energy, "Any man who would kill as brave a man as this would rob the dead!" 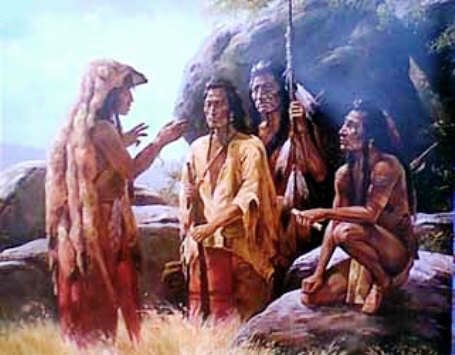 He then invited the chief to alight and enter his tent, where they held a frank and friendly talk. "The terms upon which your nation can be saved," said Jackson, "have already been disclosed. If you wish to continue the war, you are at liberty to depart unharmed; but if you desire peace you may remain, and you shall be protected." "There was a time," said Weatherford, "when I had a choice and could have answered you. I have none now, even hope is ended. Once I could animate my warriors to battle, but I cannot animate the dead. My warriors can no longer hear my voice; their bones are at Talladega, Emuckfau, and Tohopeka. I have not surrendered myself thoughtlessly. Your people have destroyed my nation. You are a brave man. I rely upon your generosity. You will exact no terms of a conquered people but such as they should accede to. You have told our nation where they might go and be safe. This is good talk, and they ought to listen to it. They shall listen to it." Weatherford is described as being "tall, straight, and well proportioned; his eyes black, lively, and penetrating, his nose prominent, thin, and finely chiselled, while all the features of his face spoke an active and disciplined mind." Silent, and reserved, except upon some great occasion, he seldom spoke in council, and when he did so he was listened to with delight and approbation. He owned a fine farm in Monroe County, Alabama, which he improved and embellished, and to which he frequently withdrew from public cares and anxieties, for the enjoyment of peaceful rural pleasures. Here Weatherford died in 1826. The Red Sticks—as the Creek warriors were called, from the fact of their war-clubs being always painted red—exhibited in this severe contest qualities of the highest order. Their bravery, endurance, self-sacrifice, and patriotism have never been excelled. In their first engagement, at Burnt Corn, they defeated the Americans and compelled them to make a precipitate retreat. They captured Fort Mims and exterminated its numerous garrison. At Tallasahatchee, disdaining to beg for quarter, they fought till not a warrior was left alive. At Talladega, Autosse, and the Holy Ground they fought obstinately, frequently rallied, and finally made good their retreat. At Emuckfau and at Enotochopco they claimed the victory. At Calabee they threw the Georgians into confusion, and were only driven from the field by overwhelming superiority of numbers. At the Horse-shoe, where they were nearly exterminated, not an Indian asked for quarter. At last, wounded, starved, and beaten, hundreds of them fled to the swamps of Florida. They had contended not only against the armies of Georgia, Mississippi, and Tennessee, together with the regular troops of the United States, but also against numerous bands of Chickasaws and Choctaws, then friendly to the latter. In every engagement these brave warriors were inferior in number to their adversaries, excepting at Burnt Corn and Fort Mims. The capture of Pensacola by Jackson's army convinced the Creeks that they could no longer rely upon the British, and that henceforth they must live in friendship with the United States. In the year 1815 peace was made with all the principal Indian tribes. This story of the War with the Creek Nation is featured in the book entitled the Indian History for Young Folks by FrancIs F. Drake and was published by Harper Brothers in New York and London in 1919. The Native American Indian story of the War with the Creek Nation provides an opportunity to read about the life and times of Native American Indians and many of their great wars, chiefs and famous leaders. A Classic Short story about War with the Creek Nation for kids and children of all ages. This short story of the War with the Creek Nation is great to read to kids and children enabling them to learn about history in a fun way. This very short story contains information about the famous chiefs of Native Indian tribes and their wars, battles and conflicts. This short Native American story has been selected to keep the attention of kids and children of all ages. Read our free short story online about War with the Creek Nation. This free, online short story about the people of famous tribes Native American Indians to increase knowledge and understanding of the indigenous people of North America and the wars and battles they fought. The story of the War with the Creek Nation. Discover the vast selection of pictures which relate to the Stories, History and Culture of Native Americans. The pictures show the clothing, War Paint, weapons and decorations of various Native Indian tribes that can be used as a really useful educational history resource for kids and children of all ages. We have included pictures and videos to accompany the main topic of this section - The Native American story of War with the Creek Nation. The videos on this website enable fast access to the images, paintings and pictures together with information and many historical facts. All of the articles and pages can be accessed via the Native Indian Tribes Index - a great educational resource for kids.